Volume 2A. Part 3: Agriculture, Natural Resources and the Environment. The economics of agriculture in developing countries: The role of the environment (R. López). Agriculture and the environment (E. Lichtenberg). Common-pool resources and institutions: Toward a revised theory (E. Ostrom). Agricultural and ecosystem services [synthesis of Part 3] (G. Heal, A. Small). Part 4: Agriculture in the Macroeconomy. Applied general equilibrium analysis of agricultural and resource policies (T.W. Hertel). Agriculture and the macroeconomy, with emphasis on developing countries (M. Schiff, A. Valdés). The macroeconomics of agriculture (P.G. Ardeni, J. Freebairn). Agriculture and economic development (C.P. Timmer). The rural sector in transition economies (K. Brooks, J. Nash). Rural development and rural policy (A. de Janvry, R. Murgai, E. Sadoulet). Agriculture in the macroeconomy: Theory and measurement [synthesis of Part 4] (P. Abbott, A. McCalla). 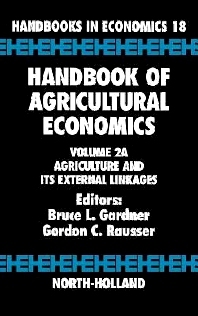 The subject matter of agricultural economics has both broadened and deepened and the chapters of this handbook present innovative work in the field. This volume contains sections on "agriculture, natural resources and the environment" and "agriculture in the macroeconomy". Volume 2B completes the handbook with a section on "agriculture and food policy". Although agricultural economists have always paid attention to these topics, research devoted to them has increased substantially in scope as well as depth in recent years.